About "NIV Faithgirlz! Bible Revised Purple/Green (Black Letter Edition)"
- Book introductions - Read about the who, when, where, and what of each book. - Dream Girl - use your imagination to put yourself in the story. - Bring It On! - Take quizzes to really get to know yourself. - Is There a Little (Eve, Ruth, Isaiah) in You? - See for yourself what you have in common. - Words to Live By - Check out these Bible verses that are great for memorizing. - What Happens Next? - Create a list of events to tell a Bible story in your own words. - Oh, I Get It! - Find answers to Bible questions you've wondered about. - Features written by bestselling author Nancy Rue. Packed with exciting features that help tween girls better understand themselves and Scripture, the Faithgirlz Bible teaches girls that the Bible is real, relevant, and, best of all, that the story of God and his people is also their story. With in-text features written by tween expert Nancy Rue, the Faithgirlz Bible uses the bestselling New International Version (NIV). Customer Reviews For "NIV Faithgirlz! 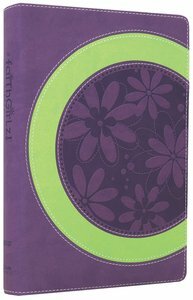 Bible Revised Purple/Green (Black Letter Edition)"
Great translation for kids and teens to understand, but also very accurate. Has areas you can take notes, little blurbs about what the book is talking about, and at the beginning of every book it tells you about the author.